OK, that last post was supposed to have been published last week, but apparently it never posted. So, two in one week for ya! We finished* (there’s always an *) the soffit built-ins this week, actually today, just in time to go back to work full-time. It was a week of trimming, scribing, and painting. So much painting, over the head. My shoulder is burning! But – we have the equivalent of about 4 or more cabinets’ worth of storage, a third in the study and two thirds in the kitchen/dining area. Even better, the structural flitch beams are now hidden – and fade away – under box beam cladding. The * is because we still need to trim the living room side where it meets the ceiling, but an idea is cooking. Holy crap, that was gross. How many cleaning/air freshening products are in that first photo? Now I remember why we didn’t eat indoors here for the first TWO YEARS of this renovation. Blech. See it, up there on top of the new, unsightly (but extremely functional!) beam? Boxes – yes! Trim – not yet. Painted and stocked. Some had to be shorter due to extra framing members. It’s hard to take a good photo of a 1 foot high, 16 foot long structure! Phew – that was a bit more involved than we originally thought. 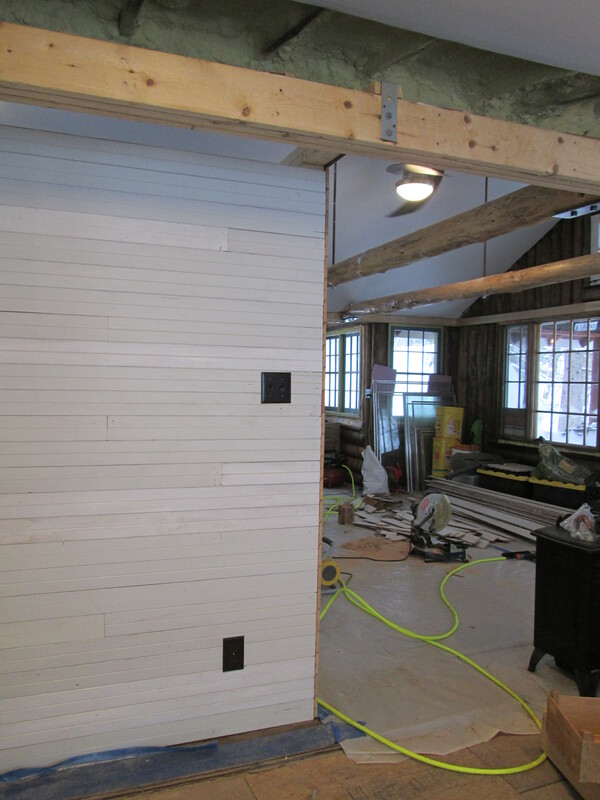 We also finished the same storage solution (though, of course, different sizes – nothing can be easy) in the soffit on the opposite end of the house. So much cleaner! Up next, we will continue to answer the question recently posed by our good friend JB, “Umm, don’t take this the wrong way, but are you going to cover up the yellow foam?” Hell yeah! Lots of parts of jobs – nothing quite done yet – and some other odds and ends. The major task while we are on holiday break has been to work on building “the boxes” – some storage shelving to fit in a small soffit area on both the kitchen and study ends of the house. 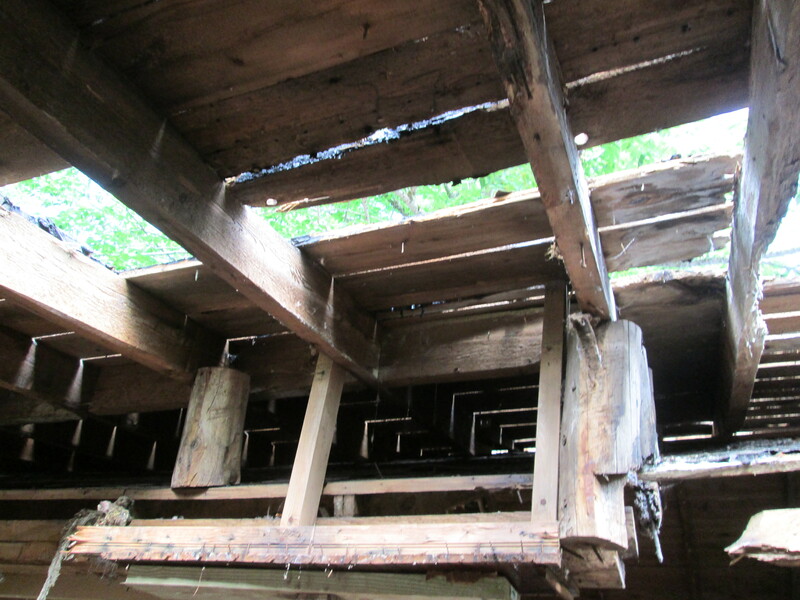 The project includes boxing in the beams we ad to reinforce with 2-bys, so that they look more pretty and less structural. We are partway through, and it’s going fine, but very slow since every bit is custom and different. Some photos; hopefully we will finish part of it soon and have some ‘afters’. The small rug is the LAST one of this design in the country. By the time I found it at an outlet in Texas, it was marked down to $7! Icicles and sun – lovely little view. New Year’s! The outdoor fridge works great. 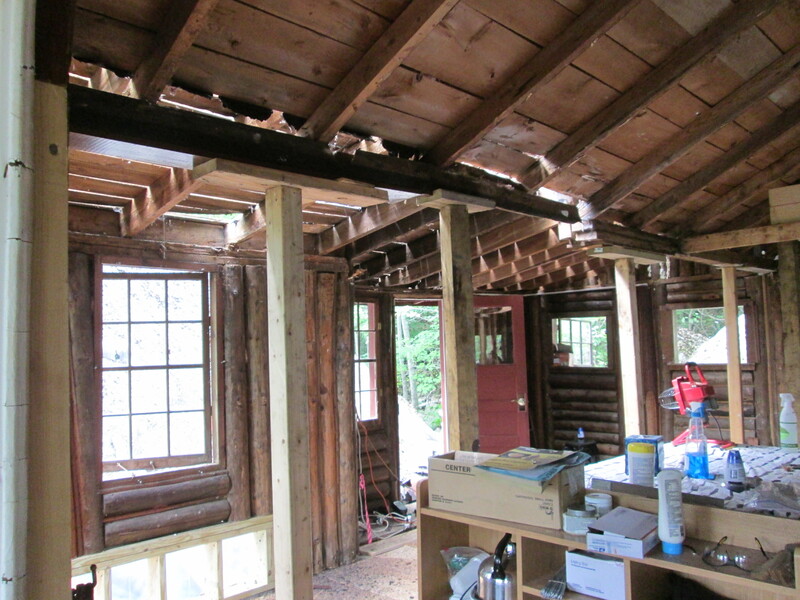 Before – a big ol’ flitch beam in need of a facelift. Pre-cut parts for the ‘boxes’. And the boxes. The backs are aluminum flashing – not yet stapled on in this pic. Boxes – installed on the kitchen side. On the living room side, we had to create loads of templates for the more complicated scribe-fit parts of the beam cladding. One beam is boxed in and needs a bit of finishing to prep for paint. But – better! I also found and fixed a few holes in the caulk while it was being used to finalize the beams. OK, this is a cheap post! We have been working on several projects, and hopefully by the end of the week will have enough done to give you a bit of a before and after (right now, it’s before and mess). So, here’s something WordPress pulled together – neat summary! Hello to our readers in France (we’d be glad to come visit you if you have a spare couch!) and other corners of the globe.